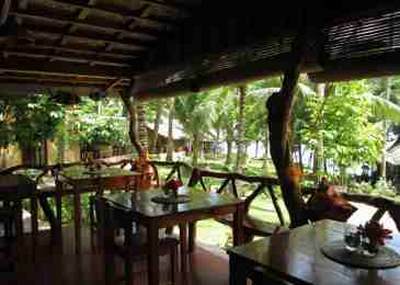 Our Camiguin Restaurants Guide database contains at this moment 34 records. Something missing or outdated? Contact us! Do you dare for real Italian pasta and pizza or do you prefer the Asian touch? Many good Filipino restaurants offer tasty chicken and porc dishes, with rice, of course. 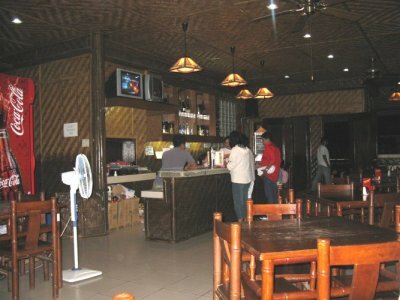 What you fortunately do not yet find in Camiguin are the big restaurant and franchising companies. No Mac Do, no Burgerking and no Jollybee! 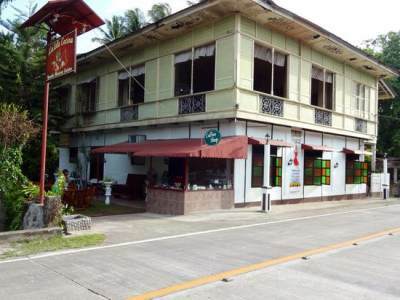 There are two restaurants missing in Camiguin. The first is a real steak-house with a real BBQ master. The second is an upper scale restaurant with maybe 16 or 17 points in the Gault-Millau guide. The southern part of the island should also receive some restaurants. The problem of the south-western coast is the sometimes very stiff breeze (Habagat) during the summer months. This list is strictly in alphabetic order. We are sorry for the Zyklone Restaurant! 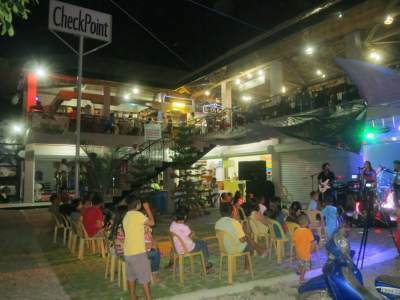 Alex offers live music during the weekends. A low cost but not a fast food restaurant. 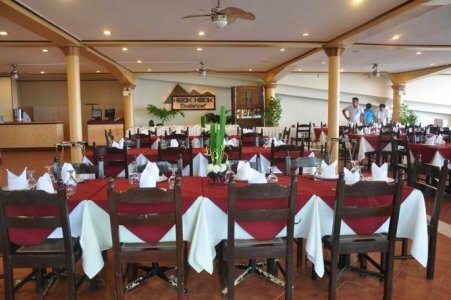 Wide selection of dishes between 100 and 200 Pesos. 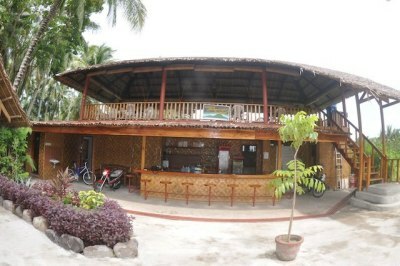 The restaurant is directly on the sandy beach of Agoho. If it's not for the food, go up there for the view. 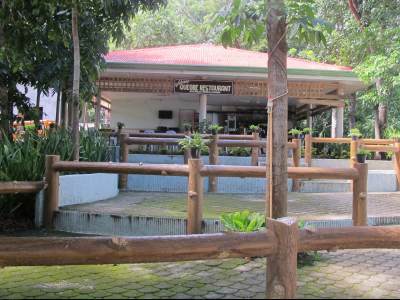 The Camridge Inn is just aside the PHIVOLCS observatory. Nice 180° view over Mambajao. We've heard that they do have a good wine cellar. We have not yet eaten at this restaurant. The chef - Evelyn - surprises with many tasteful surprises. We love her ravioli and the quesadilla. For a light meal order sashimi. 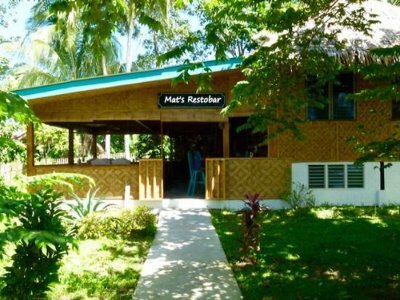 One of the best restaurants on Camiguin island. Excellent food, excellent wine and excellent location. 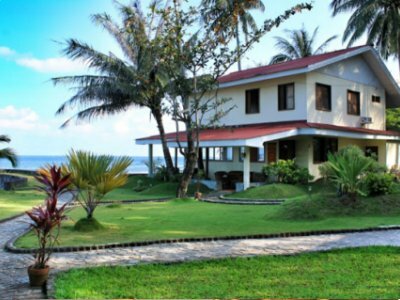 Casa Roca is a must for any visitor of Camiguin. Mainly Filipino cuisine. Fish is always good. When available, taste the excellent Kinilaw. Nice shadowy terrace on the beachfront. Beautiful sunsets. 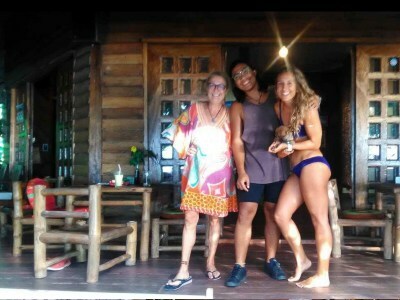 Friendly, sometimes very good service! CheckPoint Plazza is somehow an all in one food station. On ground level there are shops and on first level are several food stalls arranged around a seating zone. You can compose your lunch or dinner from different kitchens. It is a bit like these food courts in shopping malls. You like it or you do not. The quality is good but the ambiance is a bit too commercial. The only restaurant on the "other side". They offer Filipino food, sandwichs and French fries. 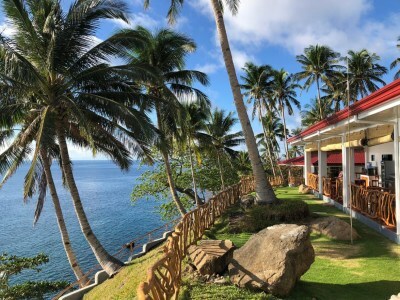 The Coral Dive is the only restaurant on the west coast that is open all year. 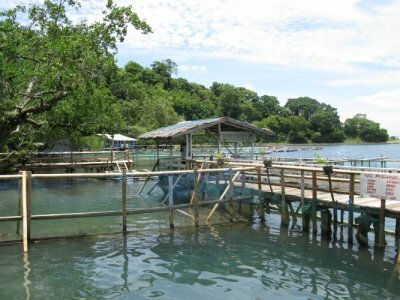 An excellent place to see the southern Bohol sea. 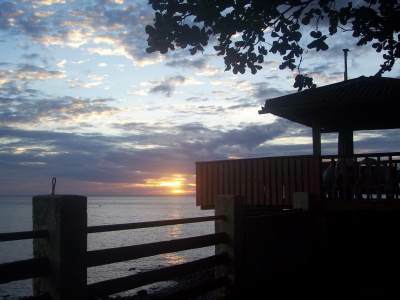 Sometimes Siquijor is visible on the horizon. One of the few restaurants that offer steaks. 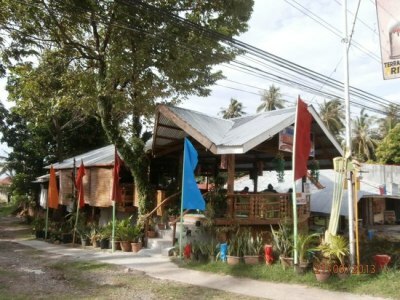 Also one of the few restaurants on the west-coast of Camiguin. Reachable in 20 minutes from Mambajao. 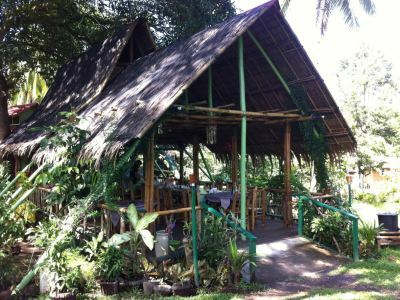 The perfect place to eat during a round the island trip. This restaurant belongs to a resort. International cuisine with a slight british touch. A place to relax. The restaurant is at the swimming pool. The Beach Club, as it is called here, has the largest choice of whisky and whiskey. Garden fresh true Asian cuisine from Vietnam, Indonesia and Thailand. When you order, you will see the chef collecting the ingredients in the garden. Small menu card full of surprises. Nice environment in the middle of a rice field. Always fresh air from the sea. 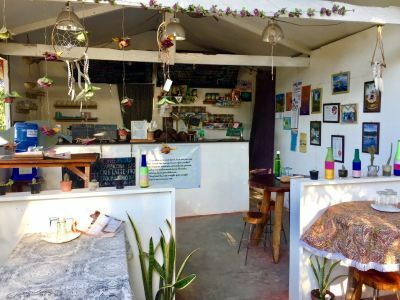 They aim to serve only fresh, raw, organic and more especially no preservatives at all. Perfect for Vegans & Vegetarians. All fish meals are excellent. We tasted: Kinilaw and grilled Lapu-Lapu. If you wish, you can catch your fish yourself. 5 tables are in the lagoon on stielts or floating. When there are big groups of guests, the waiting time can be very long. During Pannad and the Lanzones Festival the restaurant is crowded. International kitchen emphasising vegetarian menus. Always creative and healthy new dishes available. We strongly recommend to taste their home made breads. 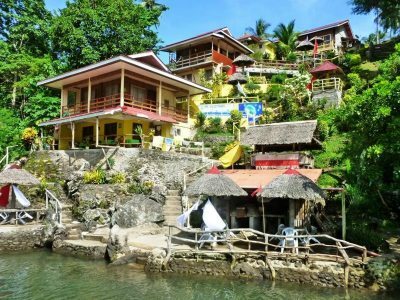 If you are lucky to be the first Sunday of the month in Camiguin. Have your brunch at Kurma. It is known even on the other islands. La Dolce Vita is known for its fabulous home made pasta and ravioli. 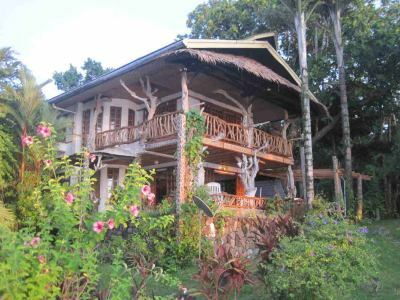 Just opposite of Camiguin airport. Mexiacan and Spanish cuisine. We had only once been there, so we cannot yet recommend a speciality. 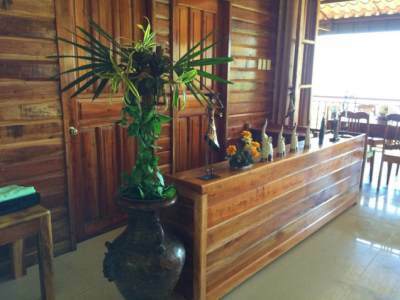 This house from the Spanish colonial era has seen different styles in the past. 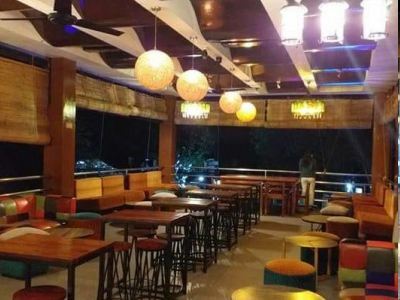 AN Italian piieria, a discotheque and now Mexican-Spanish style. 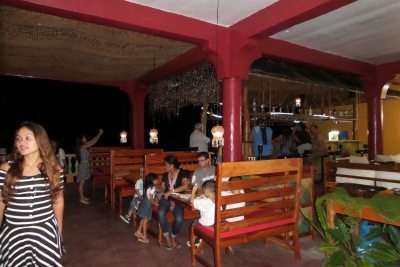 Good ambiance, located and overlooking the Taguines lagoon, fresh seafood (catch yourself if you want), with view of mountains and Mantigue island, fresh air around, affordable. A good place to eat when waiting for the next ferry in Benoni port. Everything is freshly prepared. We love the giant chicken cordon blue and the surprising Crazy Pizza. A hidden secret. Be really hungry when going there. 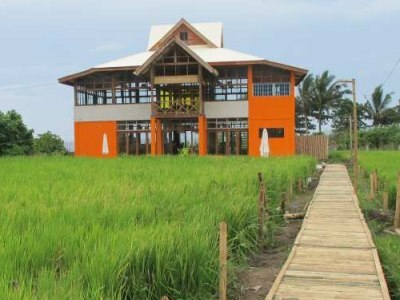 Nice new restaurant made of amakan (bamboo). There is always a fesh breeze flowing through the restaurant. Asian / European fusion kitchen. We recommend Nasi Goreng and Beef stew. But finally all menus are excellent. The choice of beer and wine has always the perfect temperature. We have never been there. Seems to be a karaoke bar that also offers snacks and drinks. Interesting architecture. Food from many countries. Sometimes special events with live music. 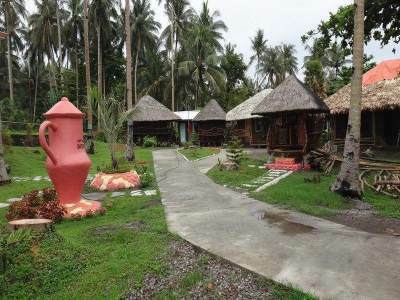 in the park of the Bahay Bakasyunan sa Camiguin. Very nice restaurant on two levels. Unfortunately the quality is only average. 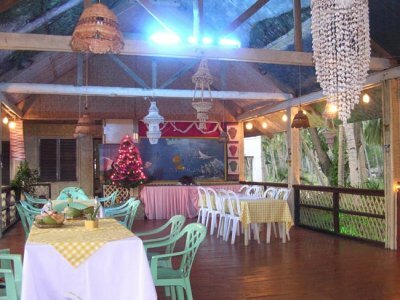 The restaurant inside Paras resort is among the leaders in Camiguin. Unfortunately the cuisine is too American style. "Nouvelle cuisine" is not simply a splatter of sauce in the plate. Seafood is excellent. Professional trained service! You have to pay an entrance fee of PHP 300. This amount will be deducted from the restaurant bill. 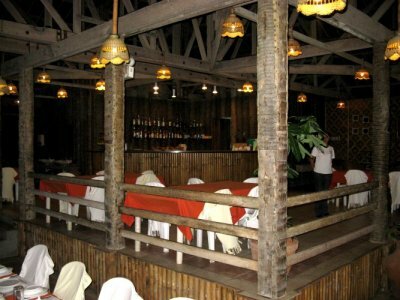 The whole restaurant is of amakan, sliced and woven bamboo. Try the buttered chicken, they are the best in town. 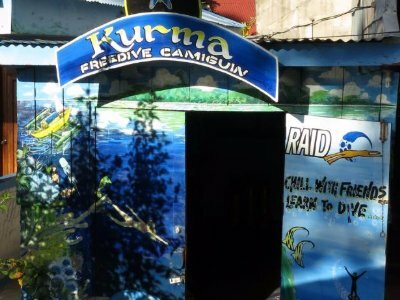 A real Filipino restaurant. Nice choice of indigenous dishes and cool drinks. Laura's food is really Spanish. A very friendly place to watch sunset and start the evening. South Californian / Mexican food. Nice terrace over the sea. We like the quesadilla. Unfortunately the restaurant is often a one man show. The waiter is also the cook. Result: Long waiting time. 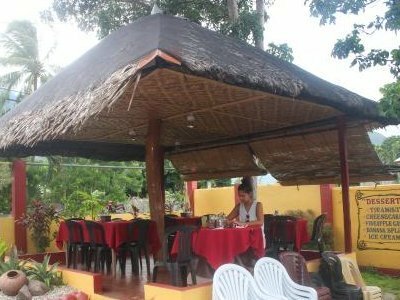 The Queobe restaurant is a bit the hidden pearl of Camiguin. 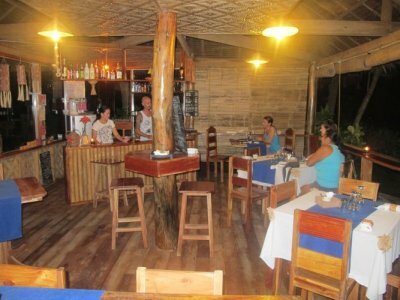 This clean and cozy restaurant overlooks the Taguines lagoon, Benoni port and Mantigue island. The restaurant is government driven. There is no website referring to it, nor are there any communication possibilities. But it is absolutely worth to go up there and have a nice lunch in the shadows of the trees. 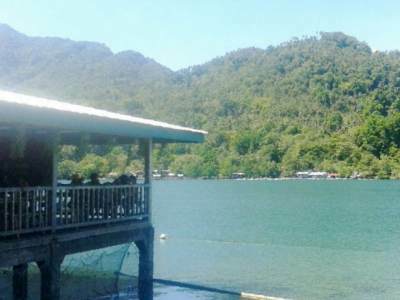 Vjandep is a well known name in Camiguin. They are better known for their famous pastels than for the recently opened restaurant. Expect Filipino food like it's cooked by mama. 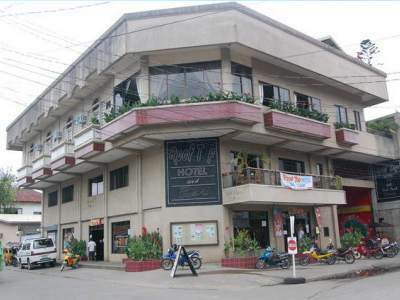 The Samuel by Vjandep was formerly known as the "Roof Top Hotel". We are a bit wondering what Vjandep will make of this bulding. We once had an extremely large Wienerschnitzel there. The kitchen is prominently based on local grown products. 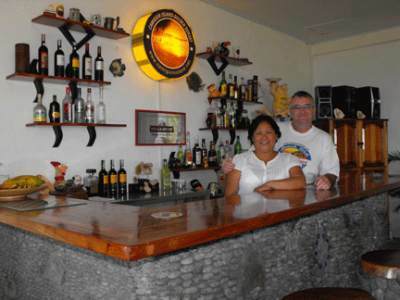 They produce their own coffee, honey and dragon fruits. 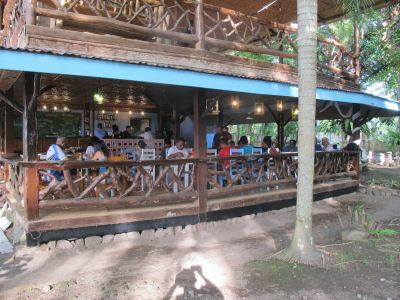 One of the most interresting restaurants in Camiguin. 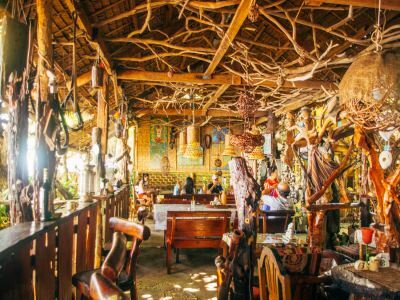 It is mainly built of driftwood, natural materials and old things out of the junk shop. This creates a unique atmosphere. One of the few restaurants uphill. Nice view over the plains of Baylao. Food from around the world with a Filipino accent. Nice, shadowy terrace on rooftop. This restaurant belongs to resort. 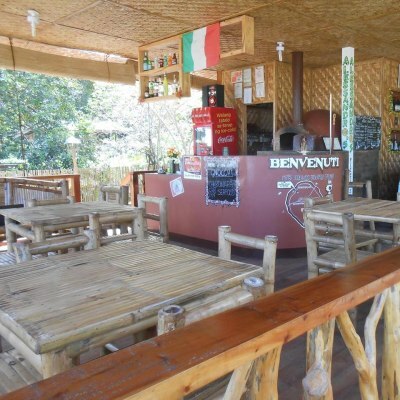 Aside of Filipino food they also offer international cuisine. A nice place on a rocky beach.